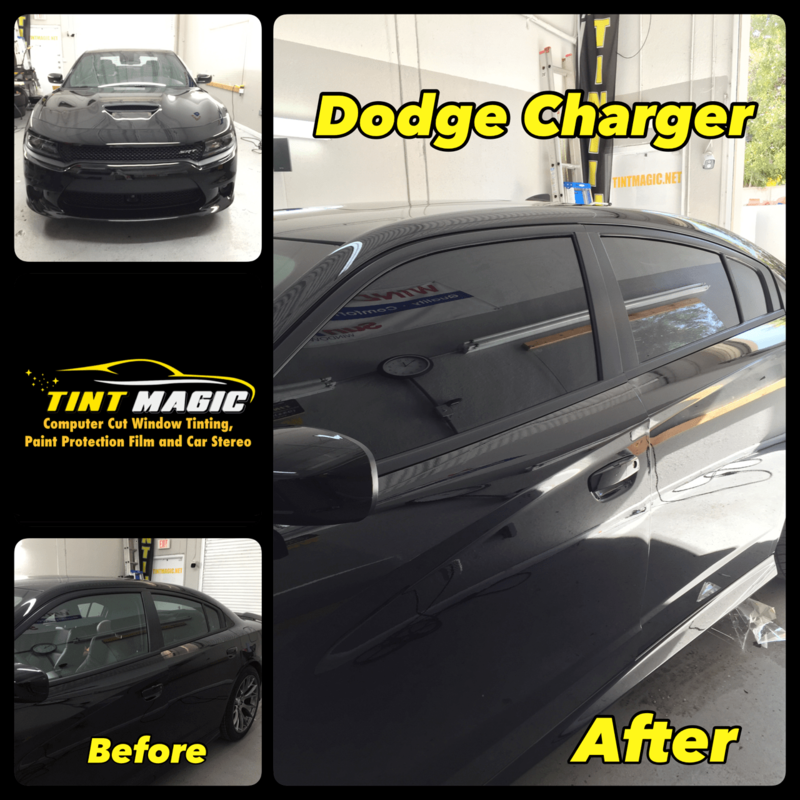 Dodge Charger at Tint Magic Window Tint serving Coral Springs, Parkland, Tamarac, Coconut Creek, Sunrise, Weston, Margate. We have applied SunTek CXP- Nano Carbon 18% all over around for the best heat rejection, 99% UV protectionand exceptional privacy. Call us for the best quality and service! (954) 840-7883. A muscle car for the family, the Charger offers the style and stance to intimidate more mainstream sedans. The sport-tuned suspension and accurate steering lend a decidedly agile feel for such a big car, without compromising a compliant ride. A 292-hp 3.6-liter V-6 (300 hp with a Rallye appearance package), an eight-speed automatic, and rear-wheel drive are standard; all-wheel drive is optional. Two brawnier rear-drive Hemi V-8s are also available—a 370-hp 5.7-liter or a 485-hp 6.4-liter. The look implies muscle, but what you see is not exactly what you get. The SXT sits at the entry end of the Charger lineup, propelled by Chrysler’s excellent 3.6-liter V-6 and the equally excellent eight-speed automatic transmission. However, this powertrain excellence is mitigated by vehicle mass—two-plus tons. In this example, with the optional Rallye Group ($1695), the V-6 is rated at 300 horsepower and 264 lb-ft of torque, a little more than the standard SXT version’s 292 hp and 260 lb-ft. The net result is 6.2 seconds to 60 mph and 14.7 seconds through the quarter-mile, hitting 96 mph. That’s quick enough to ward off drowsiness, and the driver won’t have to worry about watching the rear bumpers of Toyota Avalons and Hyundai Azeras pulling away when the light turns green.